I have been working on this recipe for Vegan Strawberry Shortcake and literally testing it for days! After a few tries, I finally got the dough just right. The biscuits are light and fluffy inside. The slightly crisp exterior is achieved by brushing with coconut milk & generously sprinkling with sugar. Canned coconut milk worked AMAZINGLY well as a creamer here, but if you can find vegan creamer…that’s a perfect alternative as well. Now, I am not necessarily a huge lover of coconut in general, but the delicate flavor that it adds to this shortcake really made this recipe special. Since it is SO hot here in Arizona, I opted for vegan vanilla bean ice cream, but if you prefer a more traditional whipped cream, you can find my recipe for coconut whipped cream here. 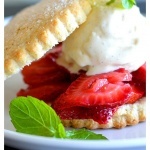 So let’s get started making this Vegan Strawberry Shortcake! We’re going to slice some of the larger strawberries and combine those with sugar. Set this aside while we make the shortcake and it will create a nice syrupy mixture. Reserve a few smaller whole strawberries for garnish. 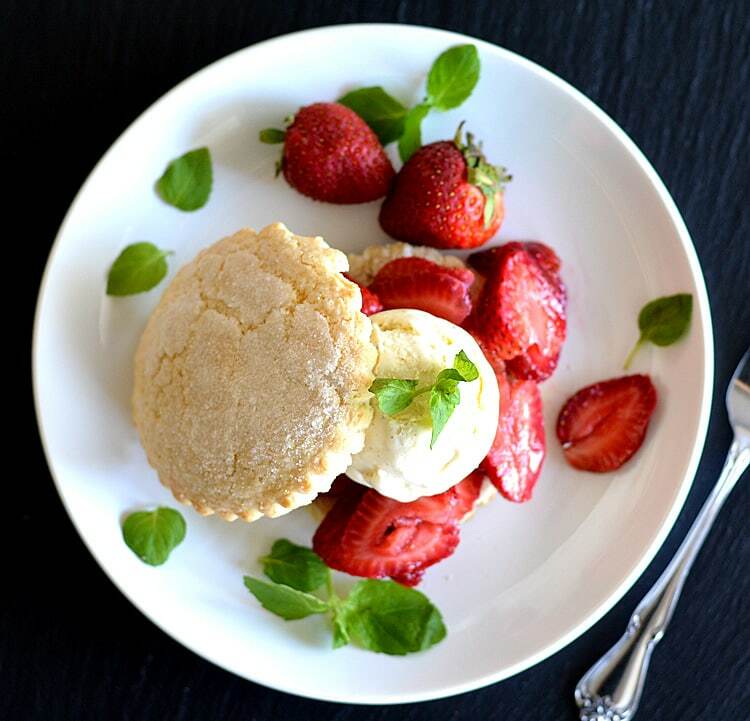 The shortcake dough is made entirely in a food processor and the best part about this dough, is that it doesn’t get tough as quickly as traditional dough when you work it. That being said, I would suggest working it just until it comes together and lightly rolling to about a 1″ thickness. Try to re-roll only once as these will yield your best textured shortcakes. Allow to cool slightly and using a serrated knife, slice horizontally. Place a few of your sliced strawberries and their juices down first and top with either this coconut whipped cream or, your favorite vanilla bean flavored ice cream. Garnish with fresh mint and a few of the reserved whole strawberries. 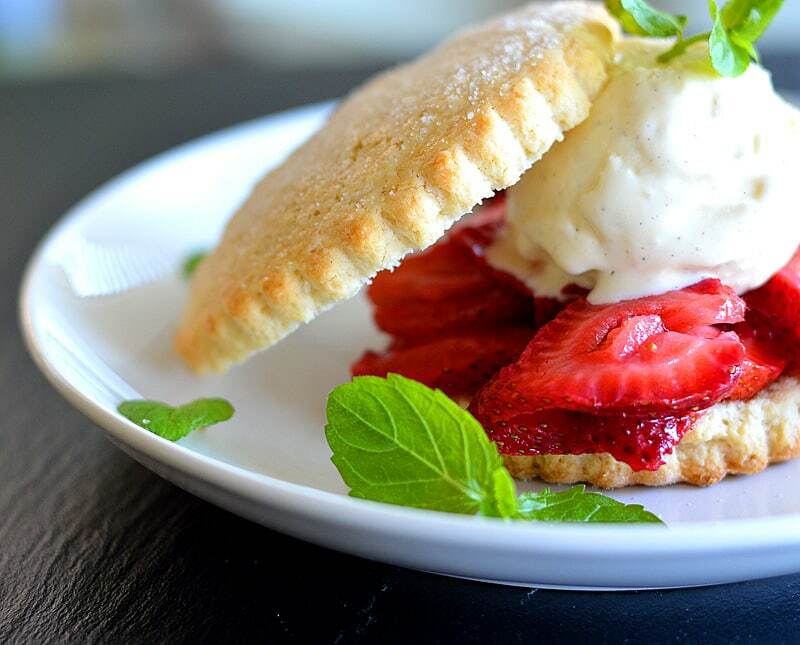 I think you’ll really love these little Vegan Strawberry Shortcakes. Serve with a cup of hot tea. Or cold iced tea. So delicate, so delicious! 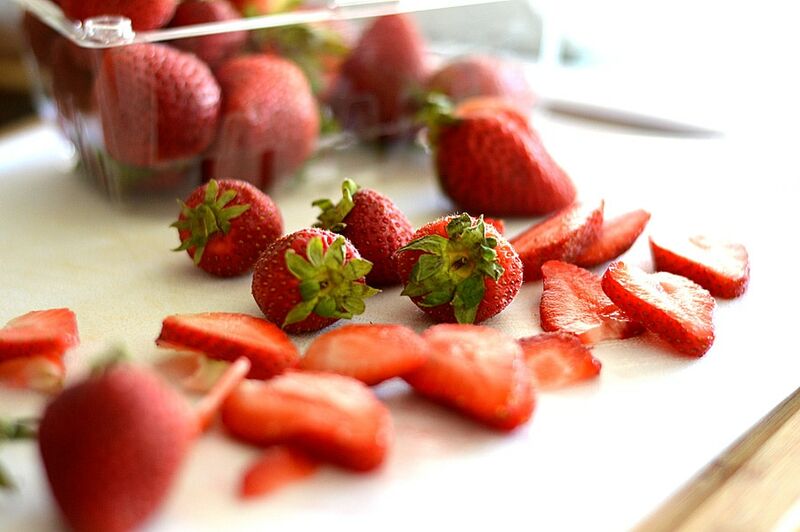 Slice some of the strawberries and combine with 3 Tbl of sugar. Set aside. In the bowl of a food processor, pulse together the flour, baking powder, salt and 4 Tbl of Sugar. Add the cold cubes of butter, processing just until the dough comes together. Turn out onto a floured surface and give it a few turns by hand to make a smooth dough. Pat the dough into a round about 1" thick. You can use a floured rolling pin to smooth out the top. Using a fluted cooking cutter, cut as many cakes as you can from the first roll, re-rolling only once or your cakes will get tough. The less you work it, the better. Place the cookie sheet into the refrigerator for 15 minutes or until the oven is ready. Brush the tops of each cake very lightly with some of the remaining coconut cream and sprinkle generously with sugar. Bake for 15-20 minutes or until golden around the edges. Do not over bake. Allow to cool slightly and using a serrated knife, slice horizontally. Arrange the sliced strawberries and some of their juices over the bottom cake. Top with either coconut cream or vegan vanilla ice cream. Set the other half offset and garnish with additional strawberries and fresh mint.